If you are not a performer that really isn’t a problem. We welcome all new members and often need help with front of house and backstage. So, if you are considering joining a community group for the social aspect then come along and meet us! We run many events throughout the year. Show week of the main musical in May is filled with evening events and is a particular highlight for all those involved. We try to run a social event each month and will send a e-mail to all of our members announcing details of each event. Below is an Annual calendar to give you an idea of the events we run. Many of our members get together regularly to see other amateur groups shows and with over 100 members there is always someone to call on for a social. Rehearsals begin for the main musical of the year normally towards the end of the month there will be a social for everyone to get to know each other better outside of rehearsals. No fixed event but we are fans of a curry and a disco and have had many fun evenings at the local curry house. It is important to raise funds for the society and this March we held a quiz night. Using our favoured Thursday night rehearsal venue this was a relaxed evening where members brought along friends and family to have fun whilst raising vital funds for the society. Is spent preparing for a firm favourite in the events calendar the Chairmans walk. The actual walk takes place on the first bank holiday in May but there is alot of prep through April by our current Social Secretary and of course our Chairman who hosts this event. The walk is normally 3-5 miles and in the past member’s have brought along their families and their dogs too. We end with a pub lunch but some have been know to skip the walk and just meet for the lunch! With our main show taking place at the end of May we normally run various after show events throughout the week ending with an after show party to end all parties. Our previous social Secretary Sue has thrown some fabulous parties and we are all looking forward to seeing what our new Secretary Verity has lined up for us this year. No rest after the main show we head straight into rehearsals for our Summer concerts and as the weather warms up there is normally a date thrown in for some drinks. 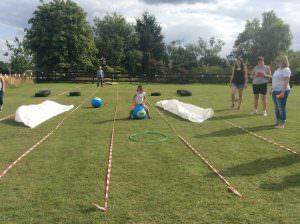 Another family favourite is the Summer BBQ and Sports day. We have had some fab days over the years and been blessed with sunshine for our family event. Members bring along the whole family for this one with classic games like the egg and spoon, three legged race, obstacle course and the wheelbarrow blindfold. This is one not to miss with plenty of food and drinks, generally a good time is had by all! Is when our Summer concerts are performed. Normally a wrap party is thrown after the last concert. By October rehearsals have started for our Winter concerts and a social is normally put in to welcome everyone. In the past we have enjoyed meals, karaoke and dog racing. With the final concerts of the year out of the way we all like to get dressed up with some sparkle and head out for a Christmas meal followed by dancing. By now talk has turned to the next musical and upcoming auditions. Normally a pre audition workshop is held which is a great opportunity to find out about the show, meet the Production team and the members.